This project was a blast from the past. 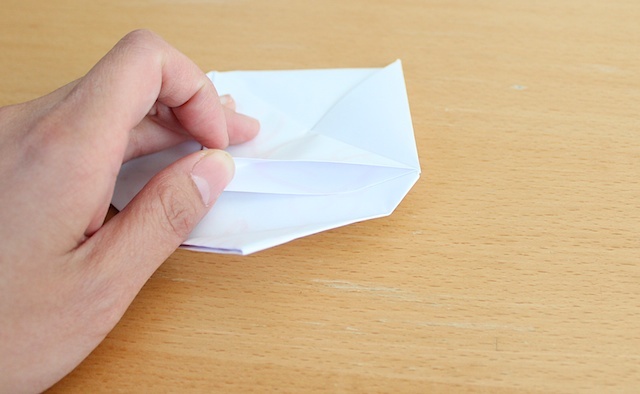 When I was a little girl in elementary and middle school in Hawaii, my friends and I would write notes to each other and fold them in cute origami. 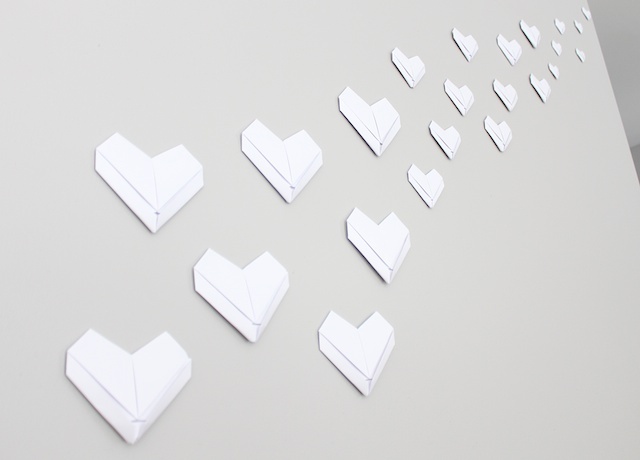 We made these hearts often because you create them using 8 1/2 x 11-inch paper. 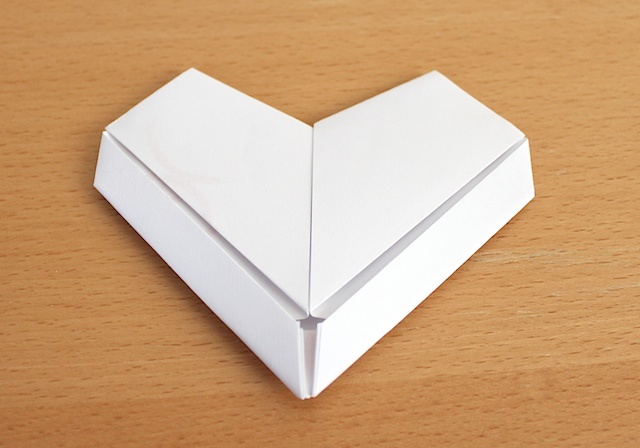 Remembering these paper hearts, I made a bunch of them in various sizes to decorate a wall we have in our living room that was a huge empty spot. 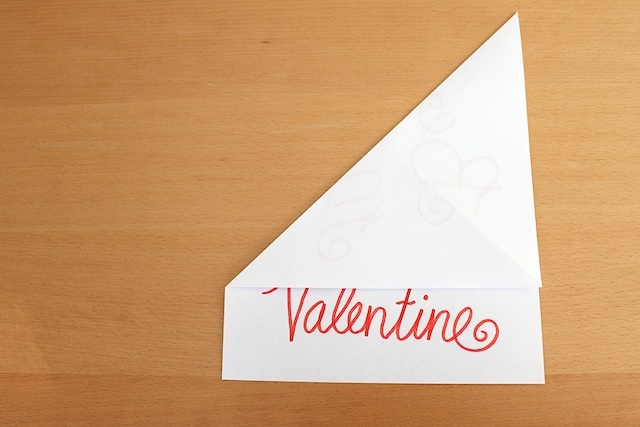 You can make these as valentines for your kids to hand out in class to their friends with special note written in each heart. 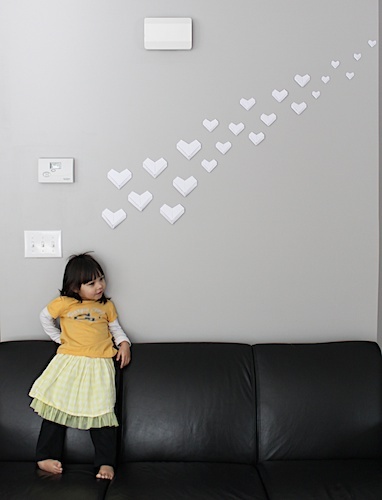 Or you can use them as decorations like I did on the wall. 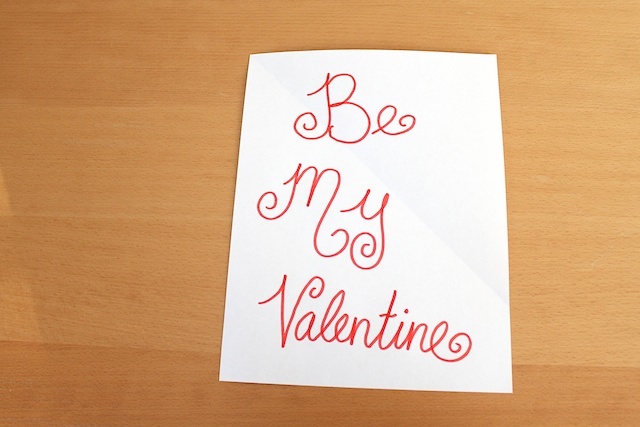 Make a few with cute scrapbook paper and frame it with a love quote. You really can do anything you want with it. This tutorial may seem long but it really is just a lot of pictures. I wanted to make sure you see what I am talking about in the directions. If you make something inspired by Simply Modern Mom, please upload pictures of it to our Flickr group to show it off to everyone. You may be featured on Simply Modern Mom. 1. 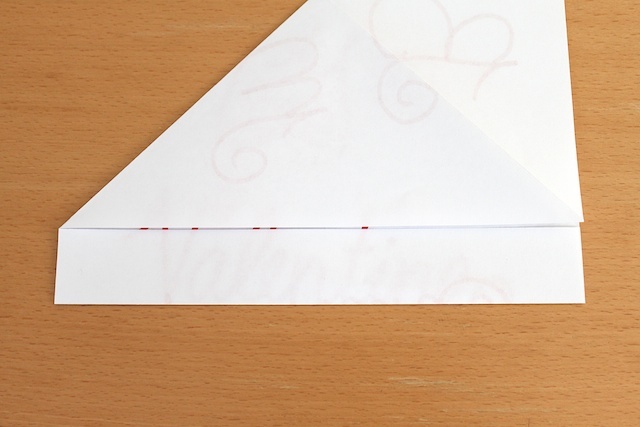 Write your note and have the writing face up. 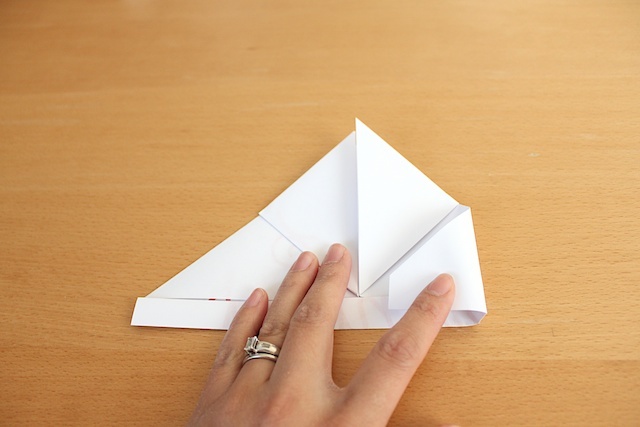 Taking one of the top corner, fold the paper into a triangle as shown below. 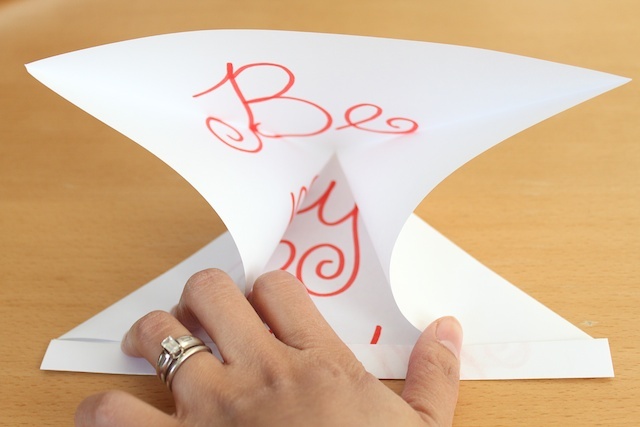 Unfold, then do the same to the other top corner (see second picture below). 2. 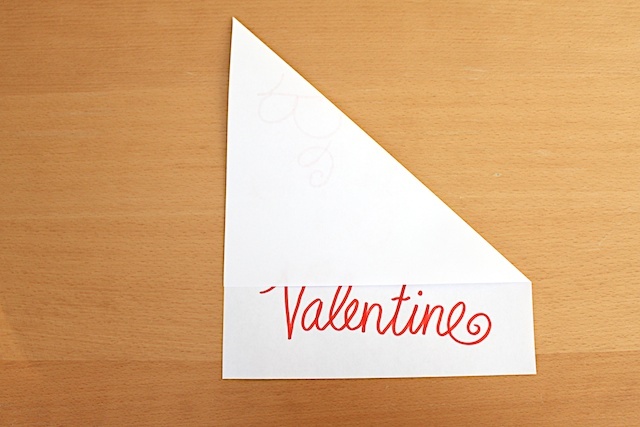 Fold the bottom part of the paper so the bottom edge meets the bottom part of the triangle (see first picture below). 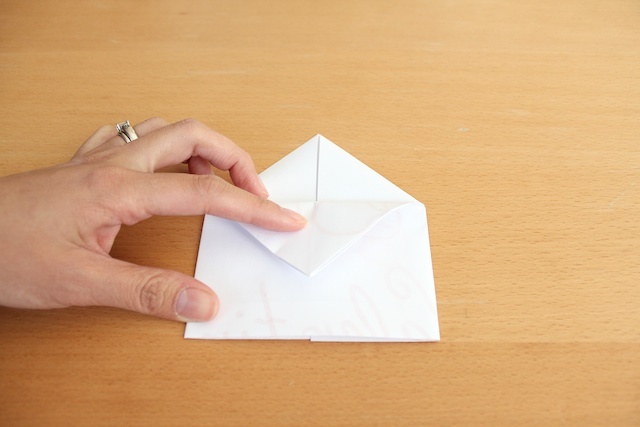 Then again so the folded edge at the bottom meets the bottom part of the triangle (see second picture below). 3. 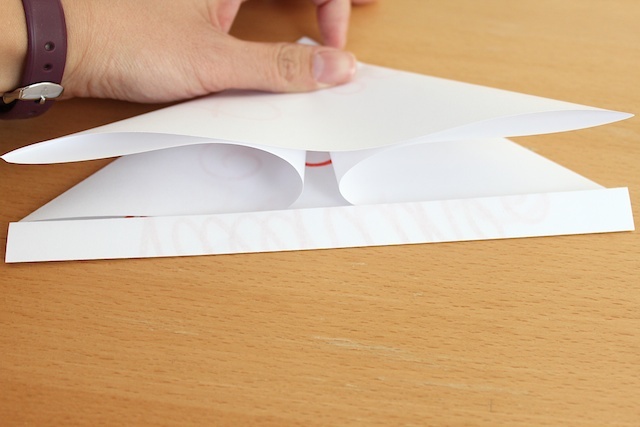 Keep the bottom fold from step 2 pressed down. 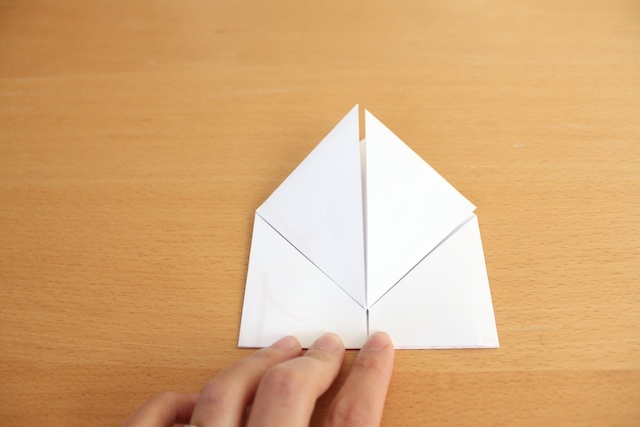 Unfold the top triangle portion. There should be a large X fold. 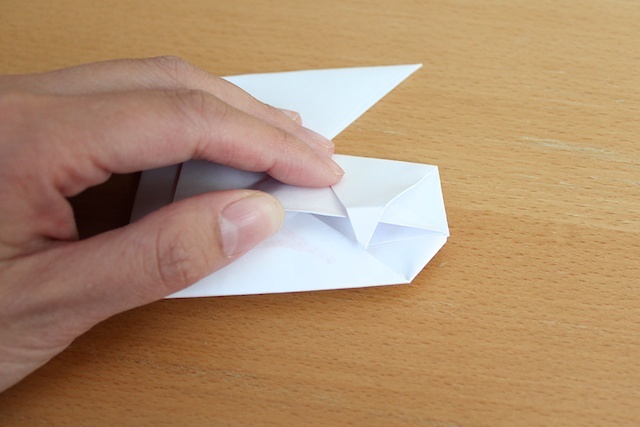 Pull in the two sides but creasing at the X fold lines made by the triangles in step 1. 4. 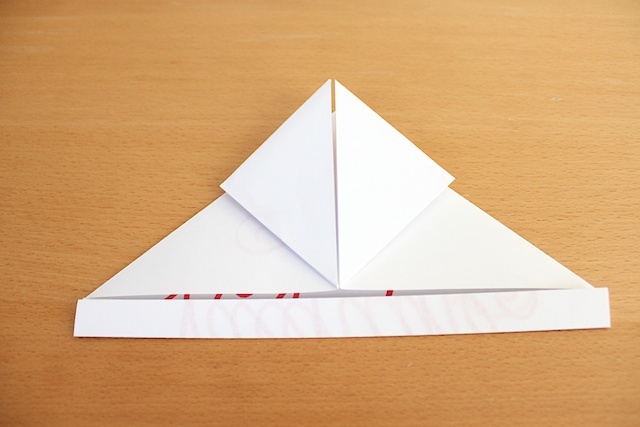 Take the two corners of the top layer from the triangle fold to the top point of the triangle and crease. 5. 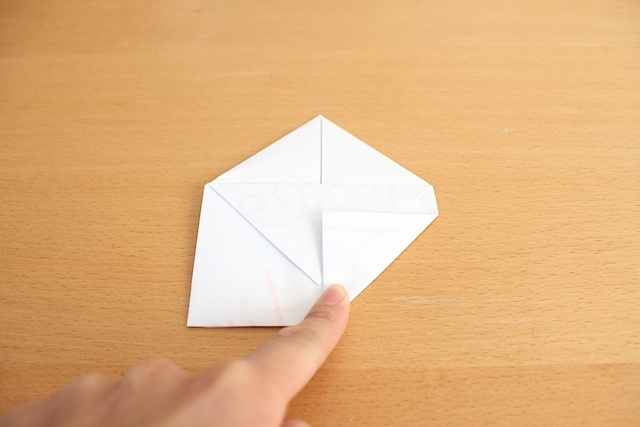 Take the two sides of the paper and fold toward the center. 6. 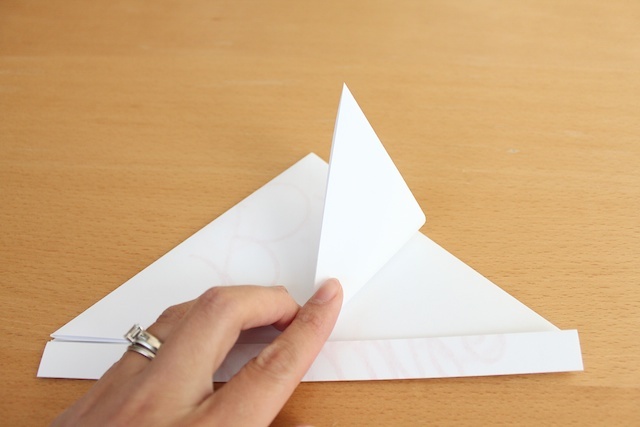 Turn the paper over then fold down the top layer of the triangle. 7. 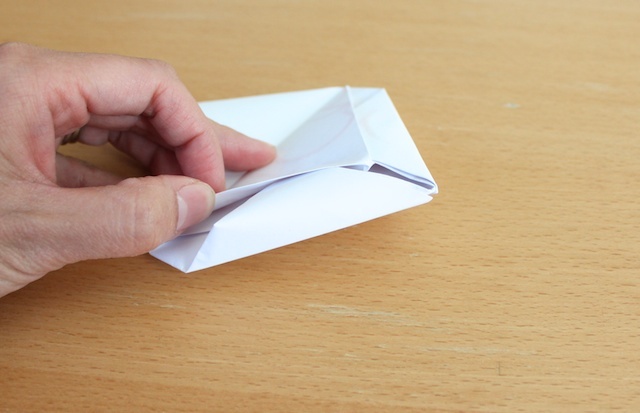 Take the bottom corner of the paper and fold toward the center forming a triangle. This creates the bottom point of the heart. 8. Open the pocket formed by the top layer triangle folded down and tuck the folded corner from step 7 into the pocket. Repeat steps 7 and 8 for the other bottom corner. 9. 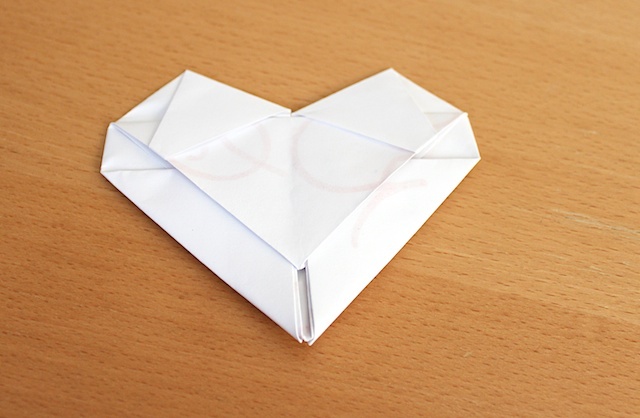 Still on the back side of the origami, take one of the top corners and fold down at an angle. 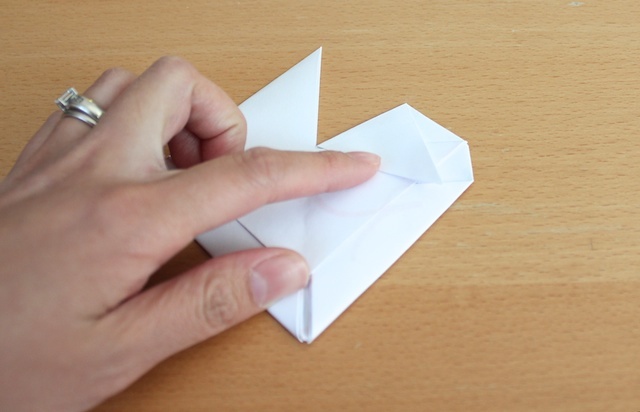 This creates the top part of the heart. 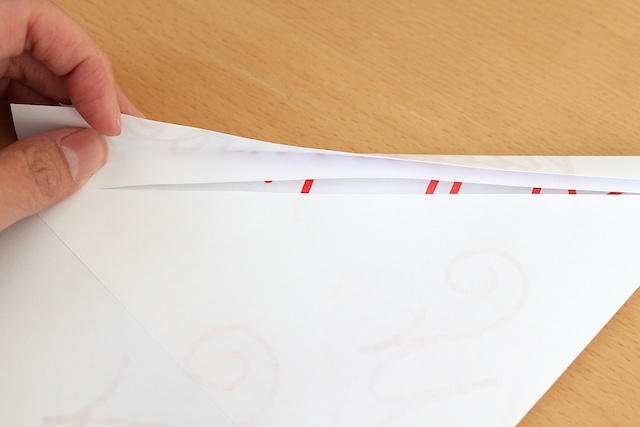 Then tuck the tip of the corner into the same pocket in step 8. 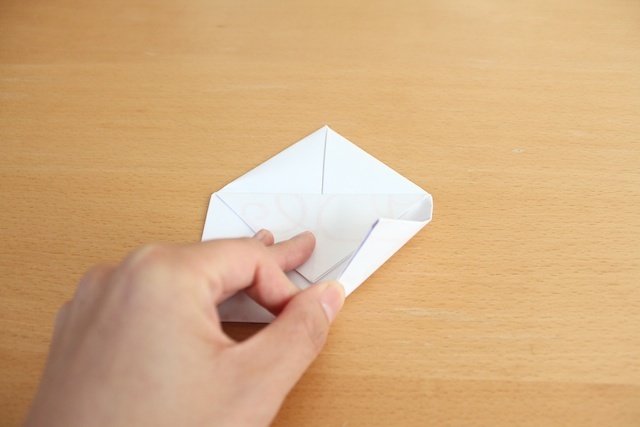 Repeat this step for the second top corner. And done! That’s it. I know the writing directions can be a little confusing but hopefully all the pictures will help you understand what I am talking about. Let me know if you have any questions. It’s also fun to do with colorful papers too. 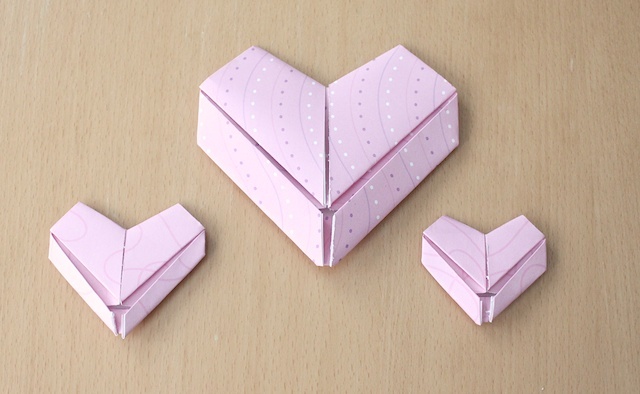 Have fun folding origami hearts! 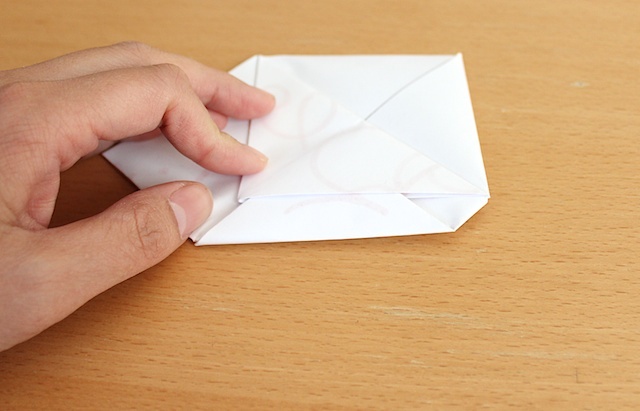 » Tell me… Did you write notes to your friends in elementary/middle/high school? Did you make it all cute? The one place i wasn’t sure exactly what to do – which was to do exactly what you were saying, the pictures helped. It’s was at step nine. I think this is what I’m going to do for my husband and kids this Valentine. Thanks for sharing how to do this in a way that i could make it. Thank you so much for the tutorial! I loved it. Very easy to follow. Those look familiar. 🙂 How fun! Thanks for the memories! Always loved getting letters like that back in the day. Great tutorial. I’d forgotten how to make them.